Many houseplants thrive on once a week watering, while other plants suffer if not watered daily. If you go on vacation or visit the lake house for a long weekend, who's going to water your houseplants for you? The Wyndham House 3 Piece Watering Globe Set is the worry-free way to water your houseplants. Fill the Wyndham House Watering Globe with water and place carefully into the soil. As the potting soil becomes dry, the Watering Globe releases water to the plant. 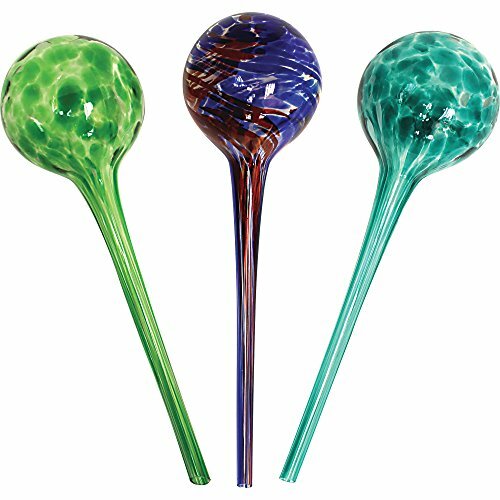 These gorgeous Wyndham House Glass Watering Globes come in three colors: green, turquoise, and a blue & red swirl. Charming and trendy when used as home décor! Excellent gift idea every gardener will love. Can be used indoors or outdoors. Shipped in sturdy Styrofoam. Each globe measures 12" long x 3" in diameter. 3 piece set.